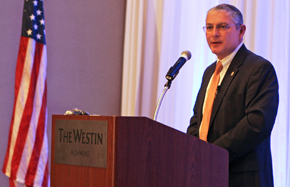 On December 8, 2017, members of the Henrico Economic Development Authority and Henrico County Board of Supervisors, business leaders, community members, and other county staff gathered at The Westin Richmond to hear Henrico County Manager John Vithoulkas present Henrico’s annual State of the County address. Given the county’s accomplishments and growth in 2017, the mood was highly optimistic. The County Manager discussed Henrico’s economic growth and new development in 2017, emphasizing the addition of over 728 new jobs and an unemployment rate which fell to 3.5%. Vithoulkas reported that during first and second quarters of 2017, Henrico County held the second-highest number of jobs – over 189,500 – in the state of Virginia, outpacing larger localities in northern Virginia and all other localities in the Richmond metro region. Vithoulkas praised the teamwork and dedication of Henrico County officials and the business community for the surge in economic activity. The County Manager placed special emphasis on Facebook’s announcement to build a 970,000 square foot data center in White Oak Technology Park and the importance of the project to the county’s tax base. Vithoulkas shared that one of the key factors that influenced Facebook executives was the Henrico Board of Supervisors’ decision to lower the tax rate on data center-related equipment from $3.50 for every $100 of assessed value to 40 cents. Vithoulkas spoke of the growth and history of existing businesses, as well. He recounted that in May of this year, Henrico recognized 230 Legacy Companies that have been headquartered in Henrico for 25 years or more. According to Vithoulkas, on average, two-thirds of new jobs in the county come from its existing businesses, and they accounted for nearly $40 million in expansion investments announced since January 2017. In total, announced projects represented over $800 million in new investment in Henrico during 2017. As 2017 brought growth to Henrico’s business community, its citizens and neighborhoods also prospered. Vithoulkas mentioned the wave of new commercial and residential development across the entire county - from GreenGate in the West End to Eastgate Town Center and industrial developments in the eastern part of the county. Vithoulkas spoke to improvements in Henrico’s award-winning education system, including the opening of An Achievable Dream Certified Academy, recognition of the Varina Area Library, and the replacement of all high school athletic fields with synthetic turf. Vithoulkas discussed how this last project, along with improvements at several recreation facilities, will help the county build on its record tourist and sports tourism spending levels going into 2018. However, Vithoulkas noted that there is still work to be done, as the county continues its efforts to address the opioid epidemic, provide same-day access to mental health services, and improve housing opportunities for Henrico residents. Towards the conclusion of the address, the County Manager shared unique insight into Henrico County’s future. He spoke to the diversification of Henrico’s population, noting a 78% increase in minority populations and that over 85 languages are now spoken in Henrico County Schools’ ESL program. He emphasized that as the county continues to grow and change, Henrico and its 326,501 individual residents can be one united community. Mr. Vithoulkas also pointed to the county’s promising economic outlook and efforts to build on 2017’s momentum. “The emphasis on reducing business taxes is an internal goal as we develop the 2018 annual fiscal plan.” While Henrico’s West End has been the locus of growth in the county, Vithoulkas pointed to the potential of eastern Henrico. “The riverfront in Varina represents incredible possibilities for our county’s future and is a focal point to our possibilities going forward,” Vithoulkas said. In summarizing a record year of growth, Vithoulkas said, “Not one of these accomplishments was a mere coincidence. What you’ve seen today is a result of careful, deliberate, and creative decisions; consistent, effective practices; and, most of all, striving toward what could be possible, even in the face of adversity. “As we look to the beginning of a new year, I urge each and every one of you to stay on our common course – to continue our journey of possibilities,” he concluded. Want to learn more? Visit henrico.com.